“When I was 21 years old flying corporate for La Quinta Motor Inn, our chief pilot was a really smart guy and he said, ‘Hey, if this jet ever ends up upside down with a CEO on board, we want you to be able to turn it right side up without killing everyone.’ I thought, ‘Makes sense to me!’” From that point on, flying became more than Kirby had ever imagined. As a child, Kirby was always playing and running around with toy planes. “I don’t ever remember saying I wanted to be a pilot, I just always wanted to be a pilot.” At only 13 years old, he began flying. By 24, he was the youngest commercial pilot at Southwest Airlines and made captain by 28. Although he enjoyed flying commercial, it became a means to pay for his true love for aerobatics. Kirby continuously trained to perfect his aerobatic skills and routines, which he was able to display at various air shows. There, he began to establish his continuously growing fan base and earned recognition for his skills with an acceptance onto the U.S. National Aerobatic Team. To date, Kirby has accumulated 13 medals in world competition. 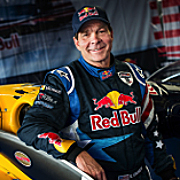 By the early 2000’s, Kirby was recognized as one of the top 15 aerobatic pilots in the world and was asked to compete in the very first Red Bull Air Race. He transferred his explosive, aggressive flying style to the racetrack and is now a two time Red Bull Air Race World Champion. Kirby resides on the “Flying Crown Ranch” between Tucson and Phoenix with his wife and fellow pilot, Kellie, and their daughter Karly. With a hangar and runway in the backyard, Kirby is only a few steps away from hopping in one of his several planes!